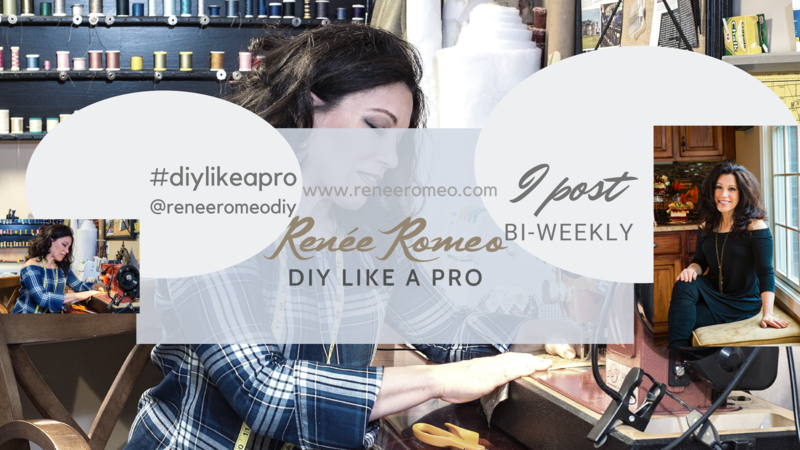 I’m Renee Romeo and I do DIY like a pro! Wouldn’t it be great to have a personal guide to assist you with all your DIY projects? That’s exactly what you’ll get through viewing my video tutorials and reviews. This website is dedicated to helping you through every project that you’d like to accomplish around your home. My no-nonsense videos are clear and to the point so that you can be successful with each project, review or life hack. I show and describe all aspects of the job so that you can get the same professional results that I do, without the high cost of hiring a professional. I am the only girl I know who owns a heavy-duty tile saw and isn’t afraid to use it. It’s not unusual for me to shovel topsoil out of the back of my pick-up truck and host a fancy dinner party in the same day. Over the years, I developed a unique DIY skill set driven by my love of decorating, design and helping people. By sharing my hard-earned DIY knowledge with you, I’m sure you can be successful with every project – both big and small – because you can follow along with my step-by-step DIY video tutorials and achieve the same professional results. My primary focus is on the best possible implementation – not perfect…but perfect enough. Above all, no matter if I decorate a cake or install kitchen cabinets, the end result must be pretty! I’ve been doing DIY for a long time – both personally and professionally. Personally, I cultivated my love of DIY while following my father around while he built my childhood home. The first solo project I completed (other than incessantly re-arranging my room) was painting my bedroom at age eleven. Around the same time, my mother bought me my first sewing machine and I taught myself to sew. I eventually toyed with enough patterns that I successfully sewed my own prom dress. My curiosity for cake decorating had me decorating fancy cakes for every family function that came along. They weren’t as pretty as they are now but were still impressive for a young teenager. When I was nineteen, I took a weekend class at a local tile store (what nineteen year old girl doesn’t?). Since then, I’ve tiled so many surfaces for so many family members, I’ve literally lost count. My love of fabrics inspired me to teach myself how to reupholster my first chair. It was my Grandmother’s living room chair and it was moving with me to my first home. The project turned out so beautifully that I eventually reupholstered all the furniture in the house. Large projects really excite me. I’ve hung reams of wallpaper; hung and finished countless rooms of drywall; finished several basements; painted just about every surface in all the homes I’ve lived in (including exterior brick – one brick at a time, to preserve the mortar color); installed brick patios; built decks; landscaped and irrigated yards; gutted and remodeled an entire home that I loved; knocked down walls; installed hardwood floors and the list goes on. Oh, wait…I even spent six months designing this pretty website (which was infinitely more painful than ANYTHING I’ve ever done!). Professionally, after graduating design school and as owner of Romeo Design, LLC, I worked on many exciting residential projects throughout Southeast Michigan. I rode the wave of the housing boom of the early 2000’s and successfully helped new homeowners customize their spaces. My first clients looked to cover naked windows in their brand new homes and I helped them by designing, sewing, constructing and installing fabric window treatments. The entirety of my business came by word of mouth and the work evolved over time to include many exciting design projects. I’ve picked so many beautiful paint colors and specified so many gorgeous furnishings and finishes for happy clients in my area, I spread beauty all over the town! I succeed with all of my projects through research, education and determination. My professional journey encompasses designs for simple features to designs for entire spaces. I chose flooring, tubs, cabinetry, hardware and every item in between. As an artist, I applied hand-painted murals, faux-finished white crown molding to look like wood grain and plain walls to look like aged stucco. The design of basement living spaces remains the most rewarding work because my ideas allowed clients to claim extra living space and enhance they way they live in their homes. I’ve even conceptualized and implemented commercial floor plans and decor for my family’s three restaurants (where I learned to make the meanest, prettiest pizza you’ve ever seen). If that weren’t enough, I even decorated a yacht – pinch me! So, since I’m no longer “for hire”, can I really teach you how to master Do-It-Yourself projects on your own? Absolutely – despite my vast and varied experience and formal education in design, I want to stress that this is not about talent. Neither I, nor any other successful Designer, Decorator or DIYer, has a special claim on being able to complete these projects. We weren’t born with these abilities…we were passionately interested and we learned and developed them. And just as I was taught, I will teach you. All you have to do is sign up for my video updates on the homepage sidebar and get to work! And you’re not just learning, you’re also improving your bottom line. I’ve been swinging a sledge hammer, operating a chain saw and baking birthday cakes so that when I pocket the savings, I can buy more raw materials to do more projects. Think of my website as a DIY Playbook that solves all of your decorating and design problems. I will either help you embrace your space or help you change it into something you love. There’s nothing quite like the satisfaction that comes with completing a project by doing it yourself! I am what you would call a ‘Jill-of-all-trades-master-of-everything-I’m-interested-in’. And, I can make you one too (and ‘Jacks’, as well)!